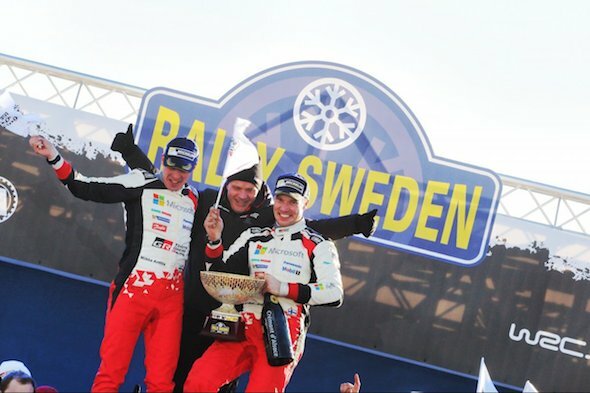 Toyota has topped the WRC podium for the first time in 18 years, after Jari-Matti Latvala took victory at Rally Sweden. The Finnish driver came into the second round of the 2017 championship narrowly behind Sebastien Ogier in the driver's championship. However, after scoring the fastest time on six of the 18 stages over the weekend, Latvala is now at the top of the championship scoreboard. After winning the first, fourth and thirteenth rounds of the weekend's rally, Latvala came into the final day with just a 3.8-second advantage over the closest competitor. However, he went on to take victory in SS16, SS17 and SS18 in his Yaris, and finished the overall rally ahead of Ott Tanak in second and Sebastien Ogier in third, both piloting new Fiesta WRCs. After the race, Latvala said: "I am so, so happy. For a new team and new car to win its second rally: I really have no words. I think I drove my best power stage ever today. Huge thanks to all the team. "Now we are super-motivated to continue like this: I just can't wait to get to Mexico. It's fantastic to win but I also feel very sorry for Thierry Neuville, who lost the lead yesterday at the super special stage," the 31-year-old added. "I have been in a similar situation myself in the past, so I completely understand how he must be feeling now. We know we were lucky, so we need to carry on improving and working for our goal."